There's a method to creating an SAP Solution Manager roadmap, writes Tony De Thomasis in this three-part series that first looks at module sequence. Editor's note: The following article is the first in a three-part series on building a roadmap for deploying SAP Solution Manager. Part one below lays out a common adoption sequence for companies to follow. Parts two and three, which will run later this week, will look at creating the SAP Solution Manager Business Blueprint structure, taking advantage of the Business Process Repository, and using accelerators to speed deployment. Since the release of SAP Solution Manager 7.1 in August 2011, more than 4,000 companies have gone live with a broad range of new functionality across all modules, including Technical Monitoring, Solution Documentation and Change Management. While the Technical Monitoring modules remain the most widely used and proven part of Solution Manager 7.1, the Test Management, Solution Documentation and Change Management modules are helping customers accelerate innovation, improve operation quality and lower costs. Many companies are unsure where to start with SAP Solution Manager, so they are not accessing its full capabilities. The amount of functionality included with SAP Solution Manager 7.1 can be daunting. The trick is to prioritize a list of desired functionality and build it using a sensible roadmap, one module at a time. 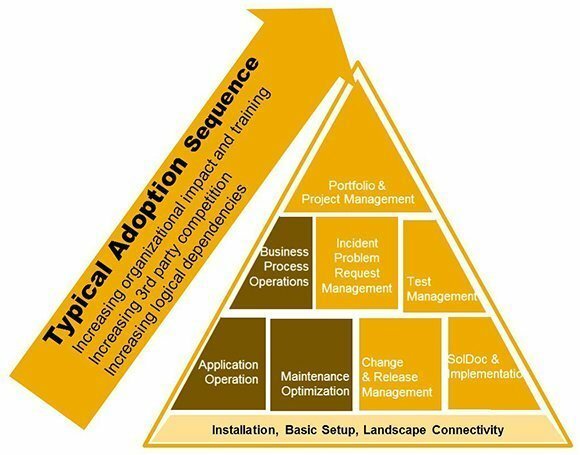 Figure 1 shows the typical adoption sequence for SAP Solution Manager. After basic installation and landscape setup, the modules in the bottom of the pyramid represent the required building blocks for the higher modules. For example, to improve the way you perform coordinated test management within Solution Manager, the first step is to create technical documentation of your SAP landscape by implementing the Solution Documentation module. This module helps define all the business processes used in the SAP landscape, which you need to do before using the Business Process Change Analyzer (BPCA). BPCA, which is part of the Test Management module, lets users review the proposed changes before implementing them. This change impact analysis helps teams optimize the scope of tests by identifying and prioritizing all affected business processes and transactions and, in turn, build a streamlined test plan. As you move up the pyramid and unlock more technically challenging modules, you begin to reduce the reliance on third-party products, as SAP Solution Manager becomes your single source of truth. The brown tiles in the pyramid represent technical modules within SAP Solution Manager that help to improve the availability and performance and quality of data. They also introduce automation. These modules are part of the Run SAP Like a Factory (RSLaF) methodology and are of most interest to those in charge of overseeing the management of the SAP system. The RSLaF methodology refers to this role as the “Head of Operations”. The lighter, gold-colored tiles in the pyramid represent project-based SAP Solution Manager modules that help to improve test management, change control and incident management processes. These modules are grouped into the application lifecycle management (ALM) category and are of most interest to the head of applications. Together, the RSLaF and ALM modules come together to help the CIO set IT strategy and resource management plans by offering scorecards and analytics designed to help drive business improvements.